In 2042 Brandon Carter was the first person to enter the Alchibah Wormhole. He was sent by R. J. Hamilton and was expected to return, if possible, within a year. When he failed to show up on time Stan Oliver volunteered to make a second attempt. He was successful though it took him 6 years for the round trip journey. Upon his return he reported seeing no sign of Carter or his ship. Oliver did bring back much of the detailed information covered in the first section of this entry. Type: F2-111-1V Star. Just off the main sequence. The -III-IV types have used most of their original hydrogen and are slightly larger and hotter then the sun. Called Sub Giants and Giants. Compared to the Sun, a G1 or G2, F stars are not only hotter but don’t last as long. It is likely Alchibah is about 3.5 billion years old as to the Suns 4.5 billion years. It’s ight, as seen through an atmosphere, should be somewhat whiter. Alchibah may only last another 700 million years whereas the Sun should have another 4 billion. 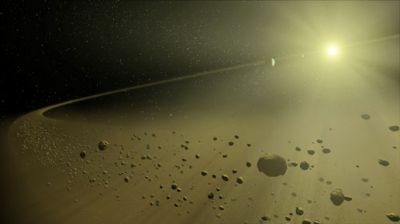 General Description: The system consists of 6 planets, numerous moons and an extensive asteroid belt with much dust scattering in the plane of the ecliptic. Planets: 6 Alc1 - Alc6 Names will be added when settled upon. Alc3. Distance from Alchibah: 201,388,000 miles with a 2,443,000 mile eccentricity. Axial inclination: 12 degrees. This should have a moderating influence on seasonal temperature variations. Surface Gravity: .98 Earth standard. The planet is slightly, about 11%, denser than Earth so an elevated heavy metal concentration is likely. Surface Characteristics: 72% water 28% land. Two major Continents and numerous Islands of varying size. Temperature on average about 2 degrees colder than Earth. Climate: From Tropical to Arctic. Atmosphere: 23% Oxygen, 72% Nitrogen, 5% various. Moon 1 Oliver Dia. 950 miles. Orbital Radius 138,000 miles. Period 13.38 days. Moon 2 Carter Dia. 185 miles. Orbital Radius 16,926 miles. Period 13.56 hours. All Contents (written or images) are Copyright (C) 2006-2011 by Jeff Soyer. All rights reserved.